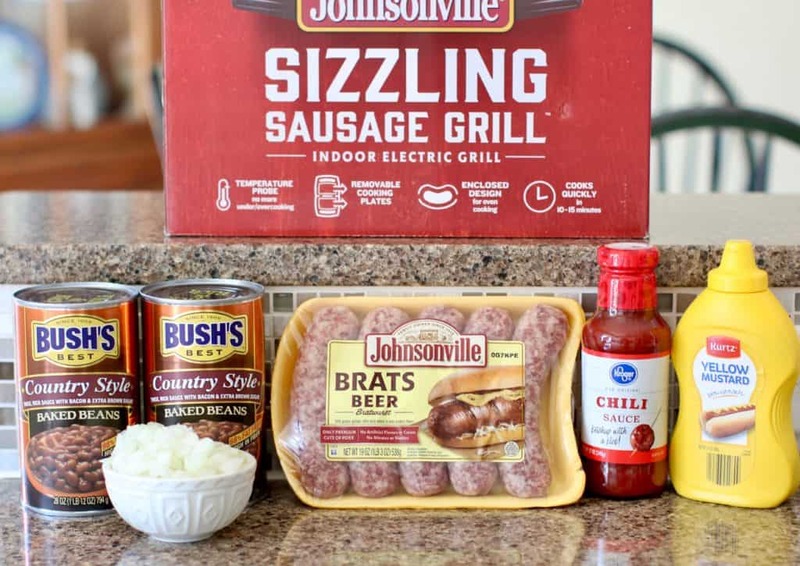 To cook that fresh, yummy sausage, I am going to prepare these brats on my Johnsonville Sizzling Sausage Grill. 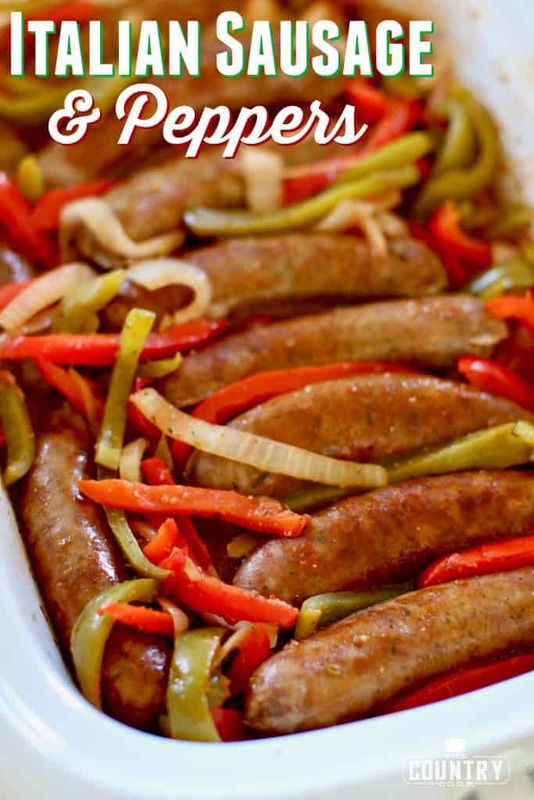 You might remember it from my recipe for Crock Pot Sausage & Peppers. It cooks sausages perfectly! Plus, it’s electric so it can be plugged right in on my countertop and I don’t have to worry about heating up a grill. 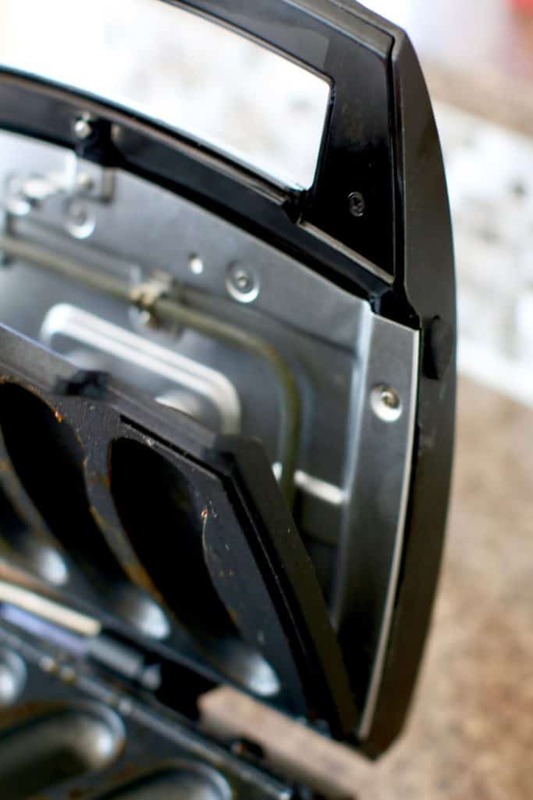 There is no preheating time with this electric grill! The Sizzling Sausage grill is available for purchase for under $80 at https://www.sizzlingsausagegrill.com. To receive the grill in time for Father’s Day, place your order by June 5th. Also, to take advantage of the free shipping and handling (a $14.95 savings! ), use promo code “FREESHIPPING” Promo code good until June 5th for orders placed on SizzlingSausageGrill.com. Note: the promo code only works on the sizzling grill website. Did I mention that it also stores on its’ side? So, if you wanted, you could keep it out on your counter or it easily slides into one of your cabinets for storage. I have a lot of small appliances and a small kitchen so space is at a premium. I always appreciate when a company thinks about these things when they are designing a small appliance. So helpful! Johnsonville really thought of everything with this design. Not only does it store upright, it also has removable cooking plates! Along with a removable drip tray. They can all be popped into the dishwasher (hallelujah!) to be washed. Because there is an internal cooking thermometer built right into the cooking plate, the sausages are always cooked perfectly. I can’t tell you how many times I have burned brats on my outdoor grill. Mainly because I am a frantic cook and I’m always juggling 10 things at once. So, the outside of the brats would be absolutely burnt while the insides were still raw. Not with this grill! They get that lovely, deep golden brown outside and are cooked to the perfect, juicy temperature on the inside because it seals in the flavor and juices thanks to the enclosed design. 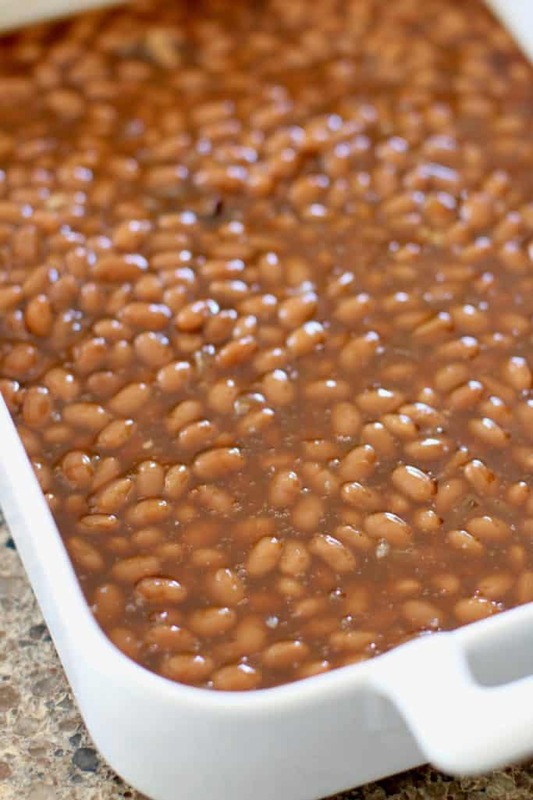 Now, let me show you how we’re going to make these delicious brats and beans! 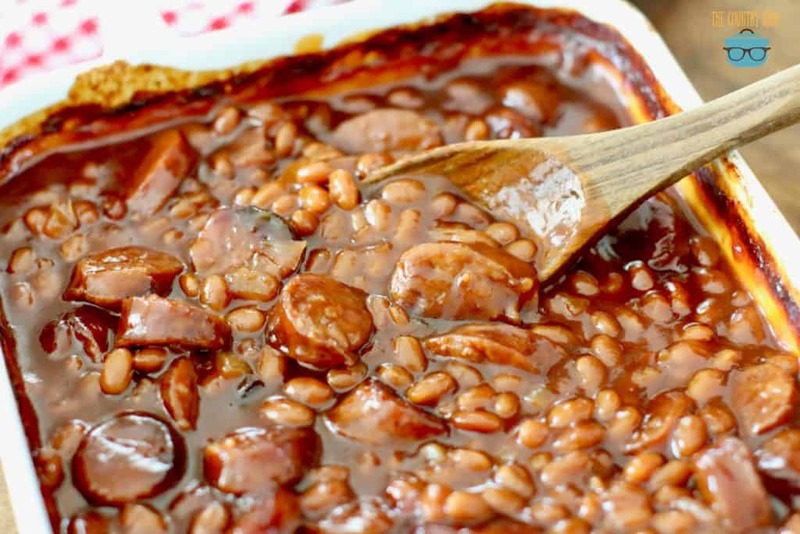 Feel free to use any flavor of Johnsonville sausage you love! 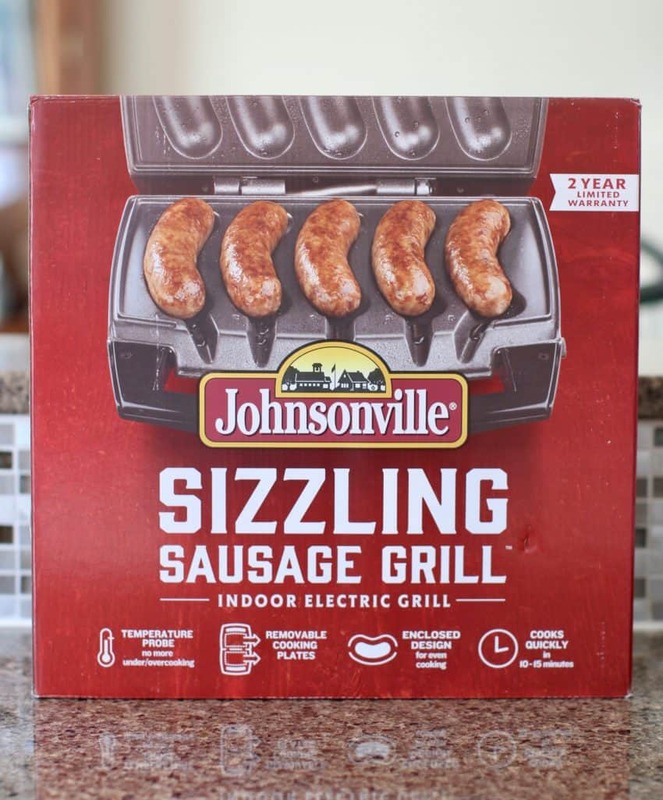 Plug in your Johnsonville Sizzling Sausage Grill and place Johnsonville sausages directly on the plates. No need to spray with any nonstick spray as the plates are already nonstick. Note: If you aren’t making the whole pack of sausages, make sure one of the sausages is in the middle position. The internal temperature gauge is in the center position. 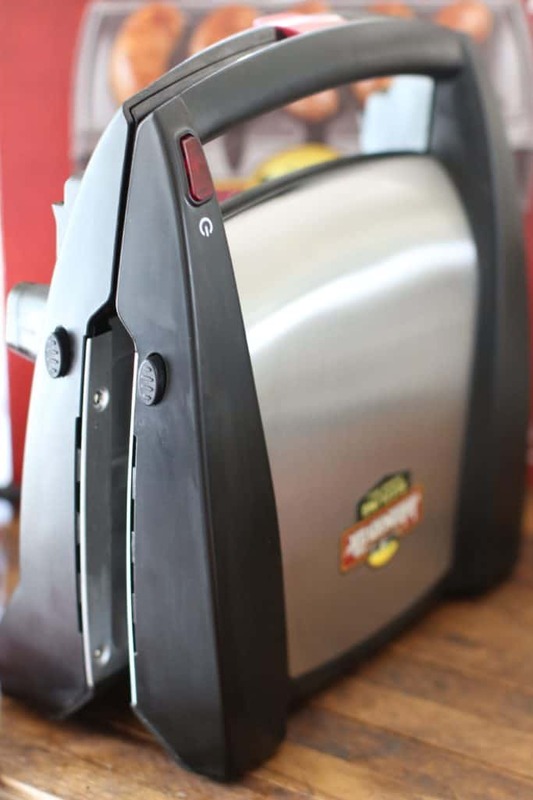 It will make sure your Johnsonville sausages are cooked perfectly! Close lid and press down until you hear the ‘click’ sound of the lid locking into place. Click on the power button and the grill will do the rest! 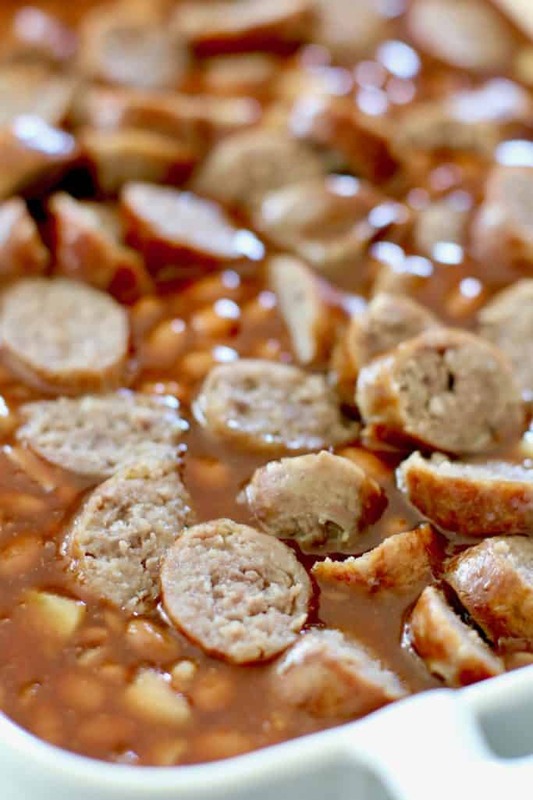 While the sausages are cooking, preheat oven to 350f degrees, then spray a 9×13 baking dish with nonstick cooking spray. 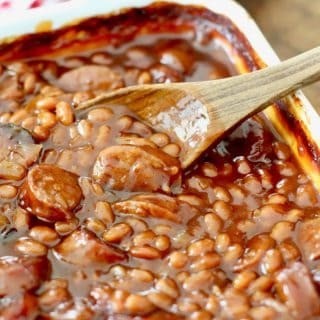 Pour in both cans of baked beans. Stir in diced onions, chili sauce, mustard and liquid smoke. Finally, stir in brown sugar. The sausages only take about 10 minutes to cook. 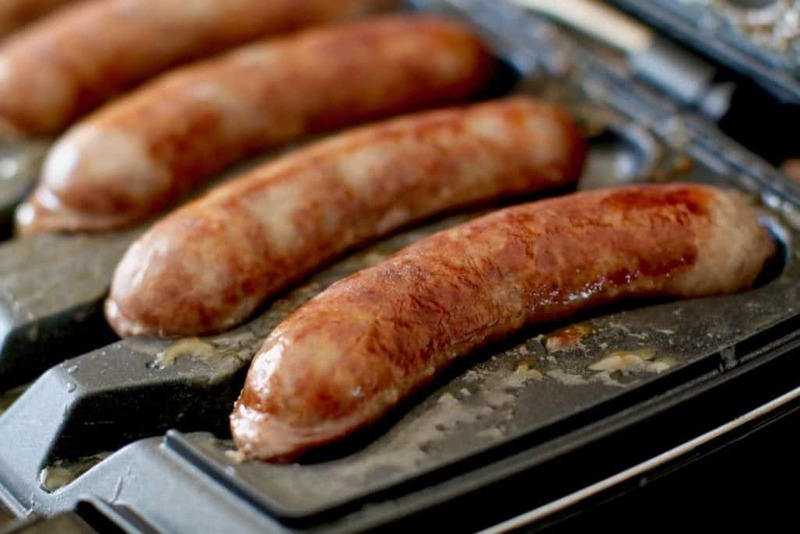 Once the timer beeps, carefully remove the sausages from the grill and place on a cutting board. 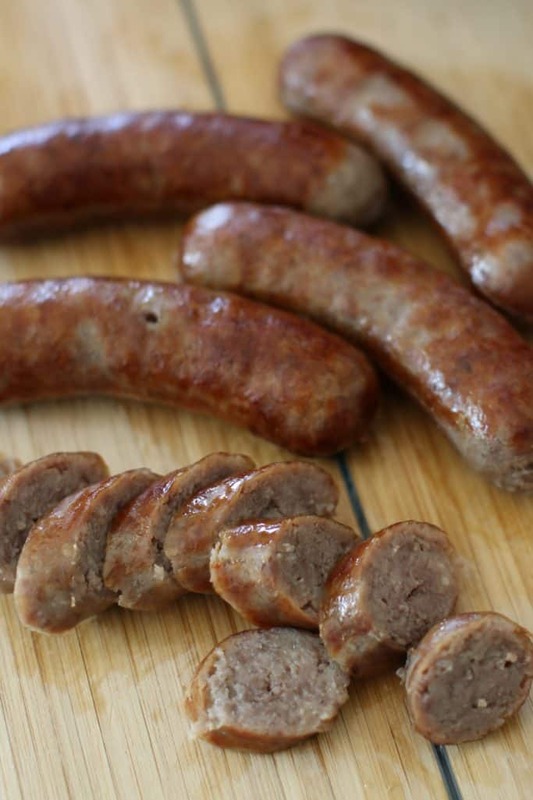 Cut sausages into 1-inch slices. 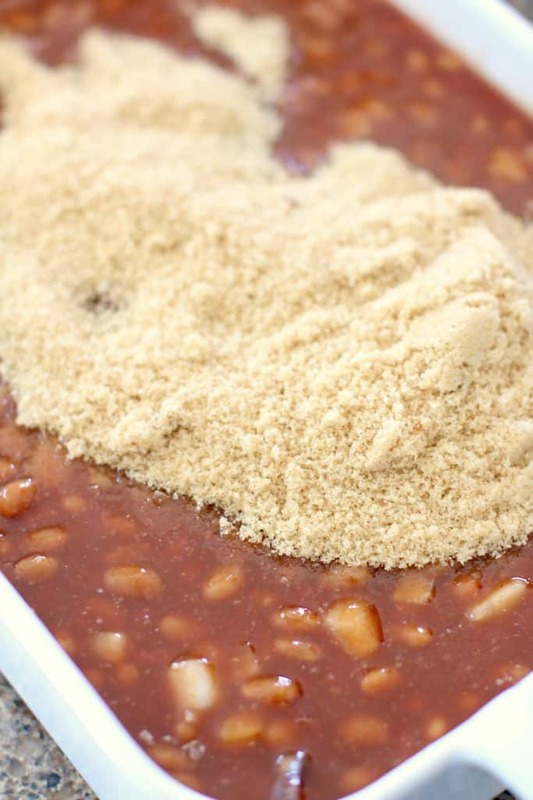 Add sliced sausage into bean mixture and gently stir. Bake uncovered at 350f degrees for about an hour. Sauce should be dark in color and thickened. 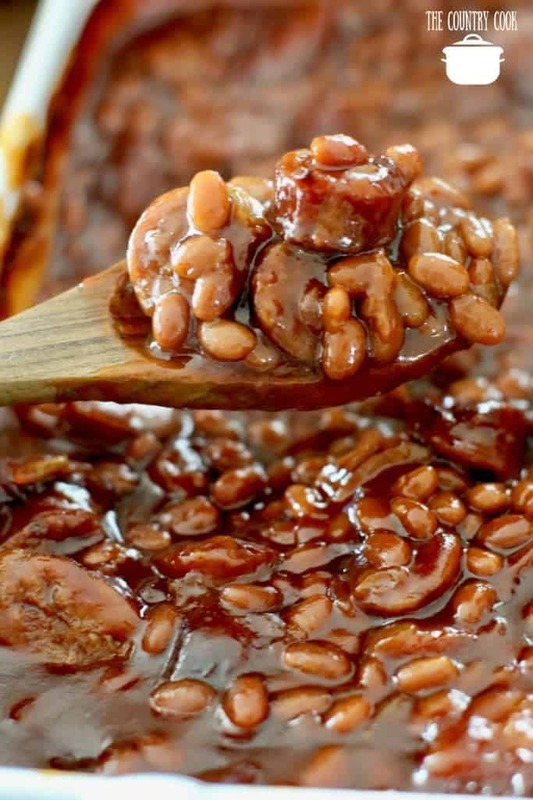 These Easy Sausage Baked Beans are made with canned baked beans, diced onion, chili sauce, cooked and sliced sausages, mustard and liquid smoke. Delicious, homemade flavor! 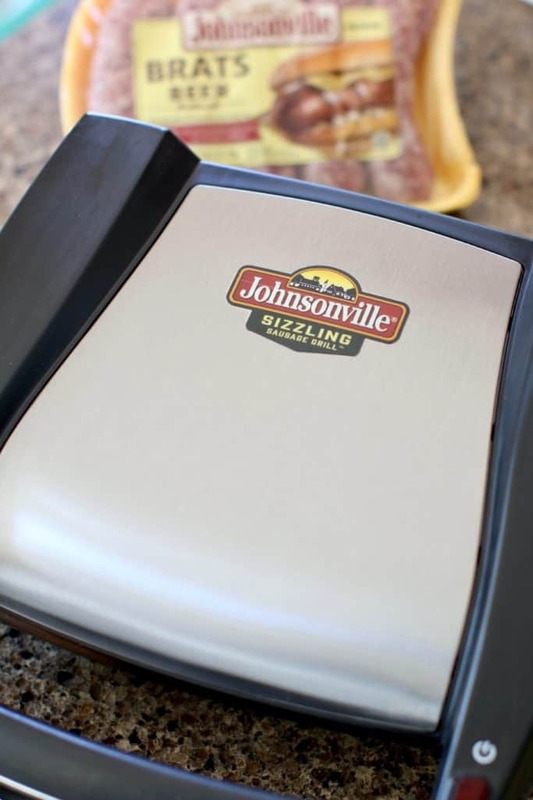 Plug in your Johnsonville Sizzling Sausage Grill and place Johnsonville sausages directly on the plates. Close the lid, lock it, then turn on the power button. 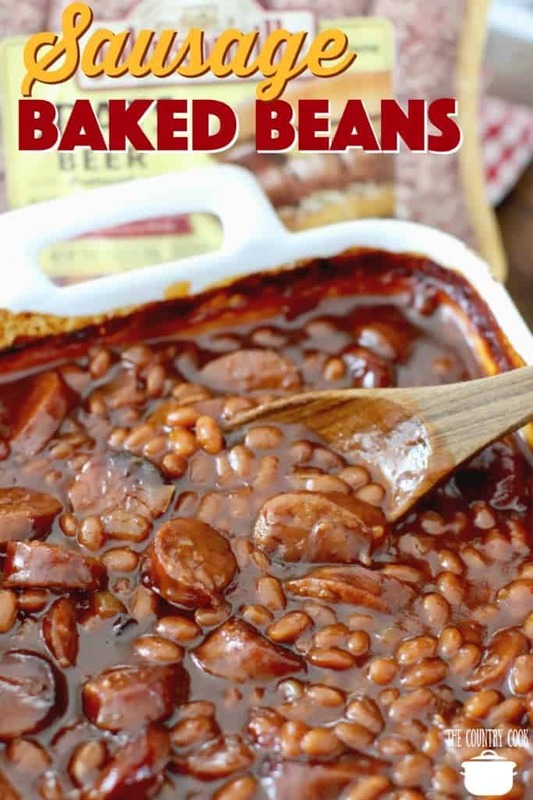 While the sausages are cooking, preheat oven to 350f degrees and spray a 9x13 baking dish with nonstick cooking spray. 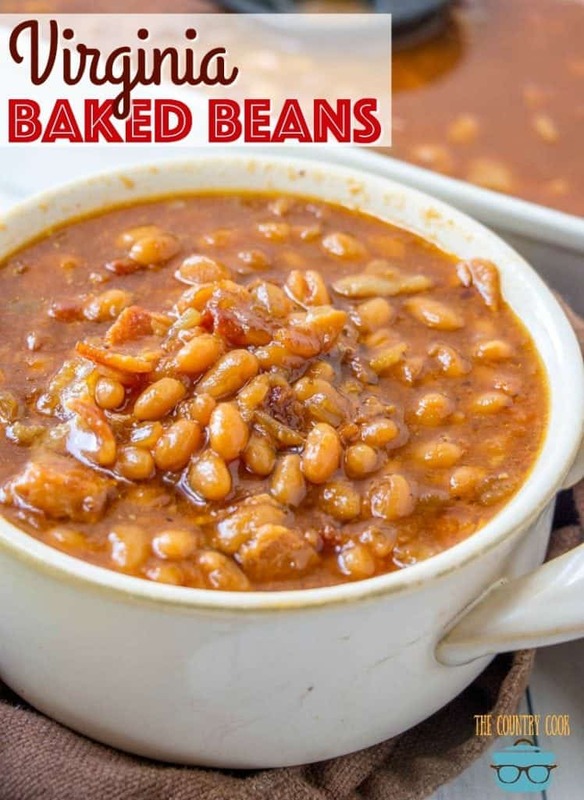 Pour in both cans of baked beans. The sausages only take about 10 minutes to cook. 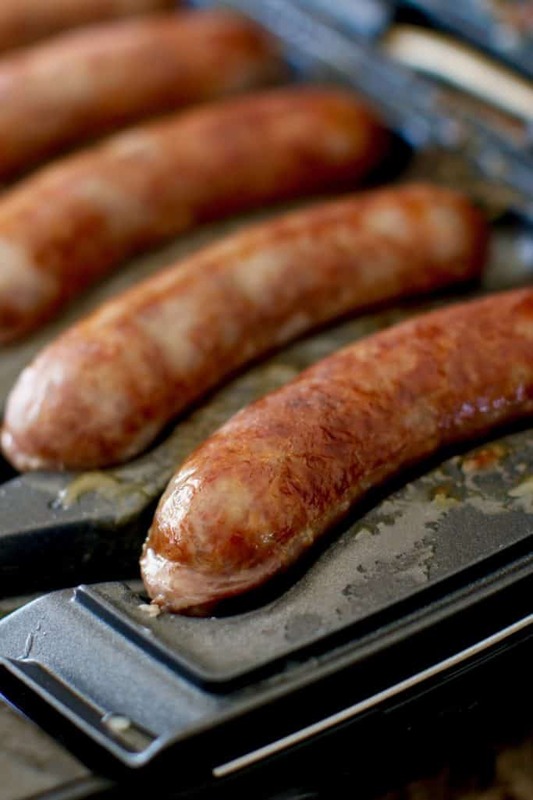 Once the timer beeps, carefully remove the cooked sausages from the grill and place on a cutting board. 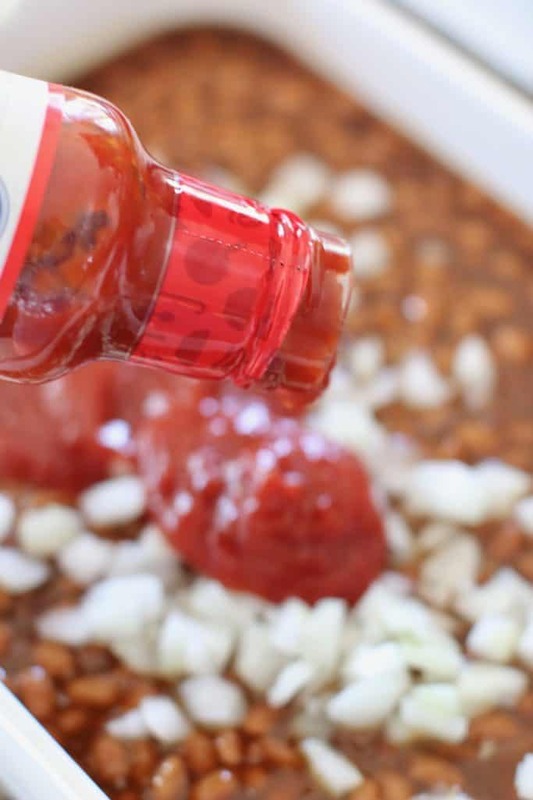 This looks yummy, but what do you suggest I can use in place of the chili sauce? I am actually allergic to pepper and basil. If I eat anything with these items, I have to be very careful about how much I eat and to have something that will take the heat away (even black pepper). Mustard can be tricky–usually I stick with honey mustard, etc. OK, Brandie, you got me! 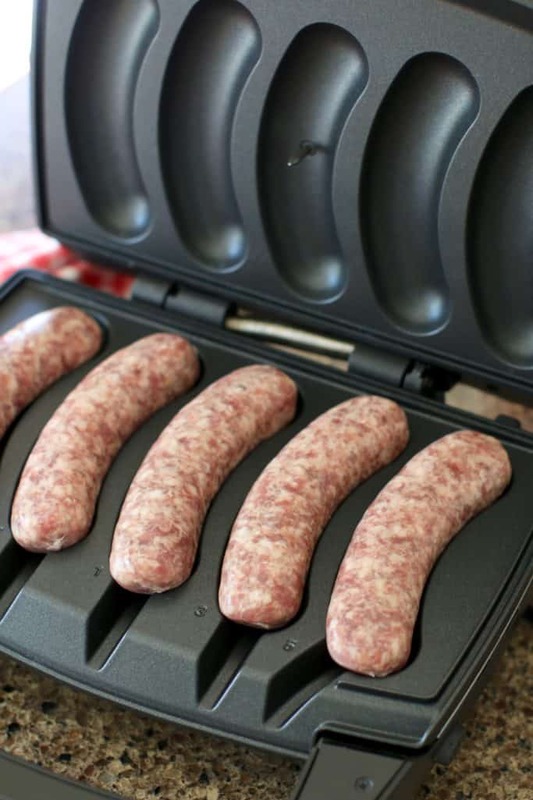 I ordered one of the Johnsonville Sizzling Sausage Grills. 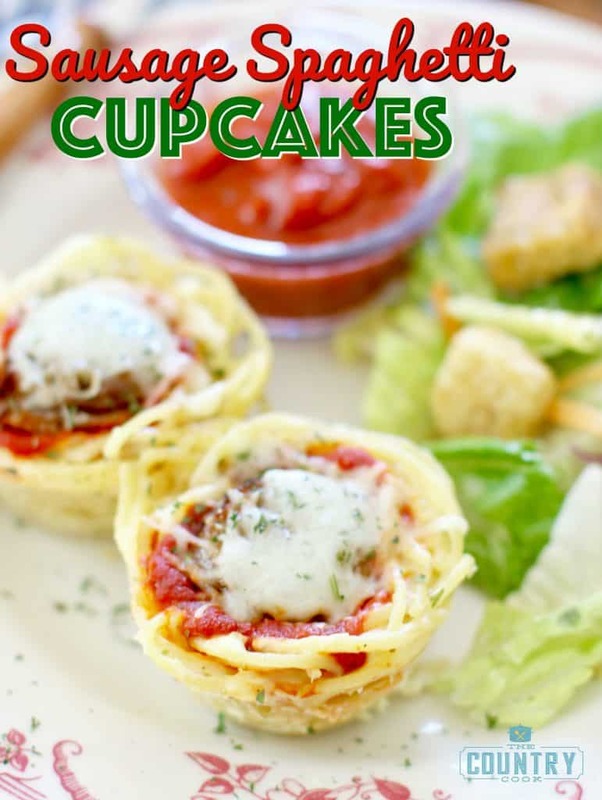 I have been looking at these for some time and this recipe finally pushed me to get one! Our 55th Wedding Anniversary is coming up June 12th and my hubby has been asking me what I wanted. I told him that I just had to have one of these grills, so that’s what I did. LOL! Now the only problem is that I have to wait for it to get here so I can make this delicious looking dish. We love Beenie Weenies and we love bratwurst, so this will be a good change for us. Thanks for sharing the recipe. Cluadine, I promise you will have so much fun with it! Sometimes I just cook up a couple for lunch. I absolutely LOVE bratwurst and Italian sausage. So I really do use this at least once a week. Also, happy anniversary! Wow! So amazing! !